Today, the Brigade of Gurkhas wishes Happy Birthday to the Queen’s Own Gurkha Logistic Regiment (QOGLR) on their 58th Birthday. 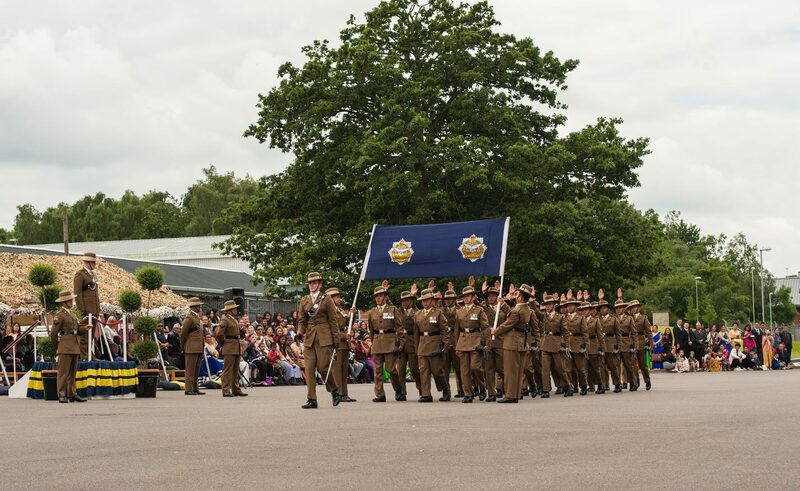 Celebrations were held by QOGLR last weekend during the Kasam Khane Parade (where new Gurkhas who have just joined swear their allegiance to the Regiment). Raised in Singapore in 1958 as the Gurkha Army Service Corps (Gurkha ASC), it was manned by British officers and non-commissioned officers (NCO) seconded from the Royal Army Service Corps (RASC) and, initially, by Gurkha officers and soldiers who had been transferred from the Gurkha battalions. Thereafter, Gurkha recruits have been posted-in directly on completion of their basic training. By 1962, the Gurkha ASC was fully formed and trained to take its place in The Brigade of Gurkhas’ Order of Battle and consisted of a Headquarters stationed in Malaya and four companies serving in the United Kingdom, Malaya, Singapore and Hong Kong. Visiting General and the Officers of the newly formed Gurkha Transport Regiment. Date circa 1960. Believed to be at Nee Soon Garrison, Singapore. In late 1962, a company of the Gurkha ASC was deployed in support of operations to quell a rebellion in the Sultanate of Brunei. Indonesian confrontation with Malaysia followed and companies of the Gurkha ASC were committed to supporting operations in Borneo and the Malay Peninsula over the next three years. During this period, the Army’s logistic services were re-organised and in 1965 the Gurkha ASC was re-designated The Gurkha Transport Regiment (GTR). At the end of Confrontation in 1966, there was a major cut in the strength of The Brigade of Gurkhas with a concurrent withdrawal of British Forces from Malaysia and Singapore. The Regiment was reduced to a headquarters and two transport squadrons and concentrated in Hong Kong by 1971. This now became its home for the next 25 years where it provided transport support to the Hong Kong Garrison, operated the Colony’s armoured personnel carriers and took part in anti-illegal immigrant operations along the Sino-Hong Kong border. In 1990, as a result of the Iraq invasion of Kuwait, a composite Gurkha transport squadron was formed and deployed from Hong Kong to Saudi Arabia in the ambulance role and took part in the Gulf War 1991. Later the same year, another composite squadron was raised, which deployed to Cyprus for six months to serve with the United Nations Force; this was also the first occasion that a British Gurkha unit had served with the United Nations. In 1992, in recognition of the Regiment’s operational service, Her Majesty The Queen approved the grant of the royal title ‘The Queen’s Own Gurkha Transport Regiment’ (QOGTR). The next year, HRH The Princess Royal was appointed Affiliated Colonel-in-Chief, which is a unique appointment to the Gurkha corps regiments. In the early 1990s, Britain’s Armed Forces were significantly reduced following the collapse of the Warsaw Pact and break-up of the Soviet Union. Coupled with the impending hand-back of Hong Kong to China in 1997, there now followed a further major cut in the strength of The Brigade of Gurkhas. QOGTR was reduced to a small headquarters and single squadron, which moved to the United Kingdom on a permanent basis in 1993. Next year this squadron undertook Public Duties at the Tower of London and in 1995 it became the first Gurkha unit to be deployed on operations in the Former Republic of Yugoslavia with the United Nations Protection Force. Further tours to the Balkans followed with NATO. From 2001, the Regiment once again began to expand with the formation of a squadron in the specialist stores role in a Royal Logistic Corps (RLC) Supply Regiment and the transfer-in of all Gurkha chefs from The Royal Gurkha Rifles. To reflect this wider logistic role, it was re-designated The Queen’s Own Gurkha Logistic Regiment (QOGLR). Another transport squadron was formed in 2005 and the following year the RLC regiment with its two Gurkha transport squadrons was re-titled 10 Transport Regiment QOGLR with the addition of a re-designated Headquarters Squadron. The Regiment took part in the Iraq War in 2003 and, uniquely, was the only formed Gurkha unit to have taken part in both the 1991 and 2003 Iraq conflicts. Further operational tours by squadrons of the Regiment to Iraq followed in 2004 and 2006 and in 2007 the Regiment deployed as part of the United Nations Force in Cyprus in the infantry role. Throughout this period, detachments of the regiment also served on operations with other Gurkha units in the Balkans, East Timor, Sierra Leone and Afghanistan. The Regiment celebrated its fiftieth anniversary in 2008 when 10 Transport Regiment QOGLR was re-designated 10 QOGLR. The next year all the QOGLR squadrons deployed to Afghanistan; notably this was the first occasion since being raised that the whole Regiment had served together on operations, to include the Colonel of the Regiment in his role as Brigade Commander. In 2011, there were subsequent deployments to Afghanistan by the Regimental Headquarters and individual squadrons in the logistic support and police mentoring roles, as well as to Cyprus with the United Nations. However, all this was increasingly overshadowed by the 2010 Defence Review leading to major reductions and restructuring in the Army, The Brigade of Gurkhas and the Regiment. At the close of 2014, combat operations came to an end in Afghanistan as did two decades of continuous operational deployments by the Regiment to the Balkans, Iraq, Cyprus and Afghanistan. In the meantime, the Regiment had faced a humanitarian challenge with the deployment of elements to West Africa in response to the Ebola crisis in Sierra Leone. By 2015, the Regiment comprised a Regimental Headquarters and three squadrons and celebrated 200 years of Gurkha Service to the Crown. Along with other regiments of The Brigade of Gurkhas it took part in all of the celebrations and ceremonial parades, to include Public Duties, to mark this significant milestone in the history of a soldier who is not a citizen of the United Kingdom and whose country, Nepal, has never formed part of Britain’s late Empire or the Commonwealth.